1. 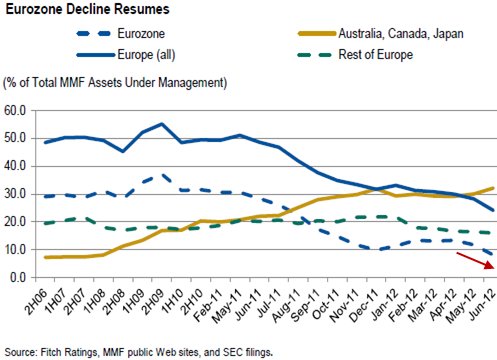 On the non-US allocations, exposure to the Eurozone continues to decline, replaced by Australia, Canada, and Japan. This is one of the main reasons Eurozone banks are exiting US businesses. 2. 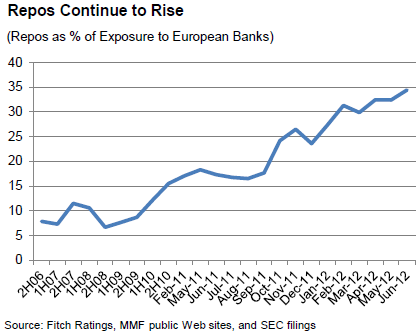 Increasingly transactions with European banks are executed via repo (secured loans). We discussed this earlier. 3. 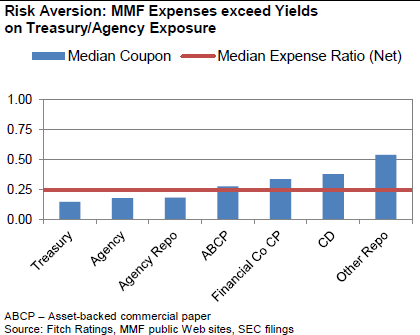 This risk aversion is becoming increasingly costly for the fund managers as yields on the "safer" products fall below funds expenses. The risk aversion is translating into near zero returns even for the "prime" money funds that carry more risk than government funds. As an example the Vanguard Prime Money Market Fund (VMMXX) returns less than 4 basis points per year. Treasury funds are of course even worse. Fidelity US Treasury Money Market Fund (FDLXX) yields 1 basis point a year. (Some Europeans would consider this return to be excellent given their negative rates.) The fund is subsidized by Fidelity because with full fees the return would in fact be negative. Fidelity also closed this fund to small investors by requiring $25,000 minimum. These are difficult times to be in the money market funds business.